The next meeting of the Coalition of Veterans Organizations will be held on Wednesday, May 16, 2018 at the Jesse Brown VA Medical Center, 820 S Damen in the 2nd Floor Conference Room. The meeting will start at 7 PM, but refreshments and CVO leaders will be there at 6 to discuss issues with anyone who comes early. Also, the pizza will be hotter then, than during the meeting. The key agenda point will be a presentation and discussion around the 1932 Bonus March, the Civil Rights Campaign of the 1950s and 60s, the Human Rights Campaign, the original Poor People’s Campaign in 1968, and the new “Poor People’s Campaign: A National Call for Moral Revival” of today. CVO is participating in the Poor People’s Campaign on Monday, May 28th (Memorial Day). Find out all about it! Pizza will be served. Get parking in the garage validated as you enter from Ogden Ave.
See you on the 16th! Original Montford Pointer Wendell Ferguson and former Montford Point Marine Association National Queen Tracy Rivers. Montford Point Marine Association members Paul Knox, Art Bingham and Willis Whitley. National Women Veterans United (NWVU) members Sharon Stokes -Parry, Sophia Murry and Portia Thompson. NWVU is a member of CVO. CVO members John Sullivan Ryan, Christopher LaFayelle and Abundio “Al” Zaragoza. Bruce Parry waves in the parade as he is followed by CVO member Christopher LaFayelle driving a police car celebrating CVO and the Mexican American Veterans Association. The SUV provided by CVO member Taalibdin Shabazz of the Muslim American Veterans Association drives down State Street. 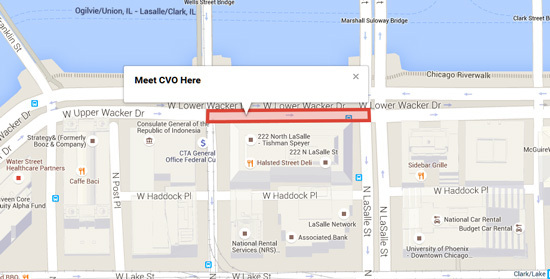 Join CVO in the Memorial Day Parade at 11 AM on Saturday, May 23rd. We’ll have vehicles. You can walk or ride. Bring the family! It will be a lot of fun! Wear your CVO hats and shirts! 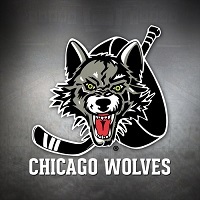 We’re number 81 and we’re forming up on Wacker Drive between LaSalle and Wells. The kick off is at noon and we march down State Street. You may be on TV. The parade will be over by 2 PM or so. All member organizations are invited to march with CVO. Join us! 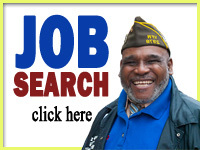 The next meeting of the Coalition of Veterans Organizations will be held on this Saturday, April 18th, at Jesse Brown VA (820 S Damen in Chicago) in the second floor Conference Room from 10 AM to 12:30 PM. Key agenda points will be the election to the Executive Committee, the May 2nd Fundraiser and the Memorial Day Parade. As usual, coffee and donuts will be served!! 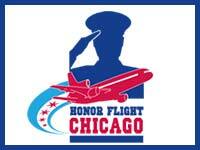 Watch Coalition of Veterans Organizations march in the 2014 Chicago Memorial Day Parade on May 24. 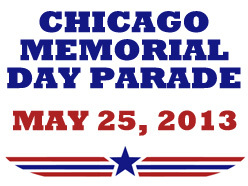 ABC 7 Chicago salutes the nation’s veterans with the broadcast of Chicago’s Memorial Day Parade, one of the largest annual Memorial Day Parades in the country. We hope to see everyone at the Memorial Day Parade on Saturday, May 24th. We are Number 19, which means we will DEFINITELY be on TV this year! Everyone is invited! Bring family and friends. You can walk or ride. The Parade is lots of fun and should be over by 2 PM or so. Be on time, we’ll be kicking off early this year due to our low number! Come out and have fun!!! on Saturday, May 25th. We are Number 91. If you prefer, you can meet at Montford Point Marine Association (7011 S Vincennes in Chicago) at 7:30 AM and ride a school bus to and in the Parade. They are asking a $3 donation to defray costs. 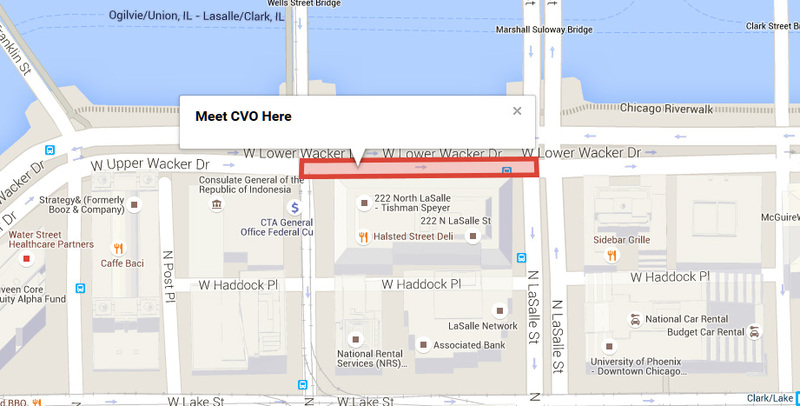 You can also board the bus on Wacker after it arrives. CVO will pay the $3 for any CVO member who needs it. Everyone is invited! Bring family and friends. You can walk or ride. The Parade is lots of fun and should be over by 2:30 PM or so.